CLEARFIELD – A former Clearfield man has been accused in a high-speed police pursuit, which resulted in a motor vehicle crash that seriously injured his passenger, while he was under the influence of drugs. Jonathan Taylor Maines, 19, now a state prison inmate, has been charged by Officer Zachary Cowan of the Lawrence Township police with felony counts of aggravated assault by vehicle while DUI, aggravated assault by vehicle and fleeing or attempting to elude an officer. He has also been charged with three misdemeanor counts of DUI/controlled substance; misdemeanor counts of recklessly endangering another person, simple assault, possession of marijuana and use/possession of drug paraphernalia; and six summaries. Maines waived his right to a preliminary hearing Wednesday during centralized court at the Clearfield County Jail. According to the affidavit of probable cause, Cowan and Officer Elliott Neeper were traveling along state Route 879 on May 2. The officers saw a GMC Jimmy enter the Sheetz parking lot; however, its occupants never got out. The officers resumed their regular patrol and re-entered the Sheetz parking lot a short time later. When they left the area, they observed that the occupants still hadn’t exited the vehicle, which they felt was suspicious since 15 to 20 minutes had elapsed. Cowan and Neeper proceeded to patrol other areas of the township. While traveling east on River Road, they observed the same vehicle pass by in the westbound lane. Cowan conducted a U-turn, at which point it appeared the Jimmy’s operator had accelerated with its speed exceeding the posted limit of 35 miles per hour. Cowan tried to catch up to the vehicle, which turned off and started fleeing on Good Street. Cowan traveled onto the next street – Bowman’s Hill Road – which runs parallel to Good Street. The officers reportedly could still tell the operator was traveling too fast for a residential neighborhood. Cowan and Neeper continued on Bowman’s Hill Road until it was observed that the Jimmy had entered the perpendicular road – Mapes Avenue. As they approached the said intersection, the operator reportedly sped by carelessly at approximately 60 miles per hour. The vehicle left a large cloud of dust and was traveling all over the roadway, the officers said. Cowan subsequently activated their unit’s emergency lights, caught up with the vehicle and conducted a traffic stop in the area of Patton Street and Kerr Avenue. The officers notified Clearfield County Control of the traffic stop and proceeded to approach the vehicle. Cowan heard and saw Neeper order the passenger to get back inside; he also saw that Neeper had drawn his taser, so he drew his duty weapon for safety purposes. The Jimmy then turned right onto Kerr Avenue and a pursuit ensued with the operator failing to stop at posted stop signs at the roadway’s intersections with Palmer Street and River Road. The officers’ pursuit continued through a “large cloud of dust,” and they were able to view the vehicle’s taillights in the distance, as the operator gained a lead on the officers on River Road. Cowan reached a speed of approximately 70 miles per hour in an effort to catch the vehicle. 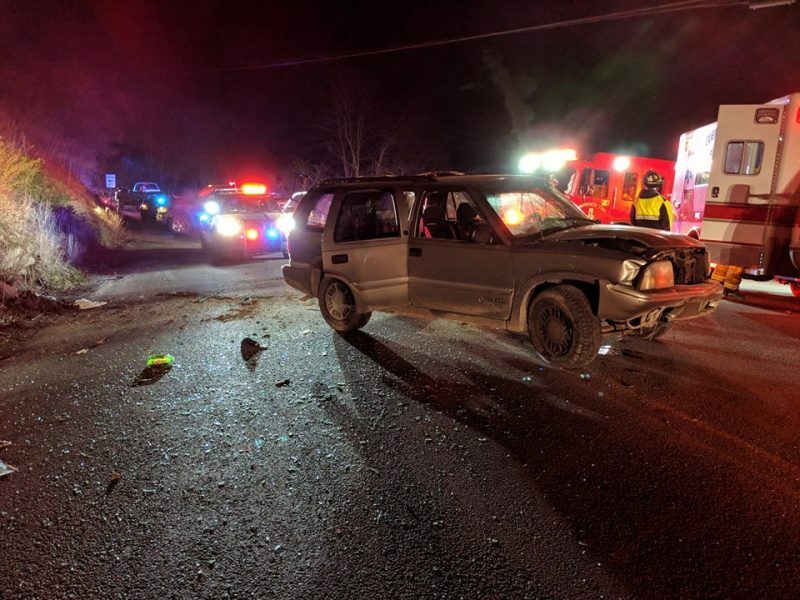 The officers lost sight of the vehicle as it crested the hill prior to High Level Road, and they alerted Clearfield Borough police of their direction of travel. Cowan then slowed their patrol unit down to try to determine if the operator had continued straight on River Road or turned off onto High Level Road. Upon cresting the hill, the officers noticed large skid marks, which started in the opposing lane and appeared to enter High Level Road. On High Level Road, they observed the Jimmy had crashed and overturned in the center of the roadway; there was a large cloud of dust and smoke visible. Upon exiting their patrol unit, Cowan and Neeper drew their duty weapons and went to approach the vehicle. Neeper was able to identify the front-seat passenger who had been ejected through the passenger’s side window. The passenger was reportedly severely bleeding from his head and body, and it was noted he held approximately five warrants through the township police. Neeper notified County Control and also requested emergency personnel and a medical helicopter. Cowan approached the driver who was still seated and secured in the driver’s seat and identified him as Maines due to previous arrests for DUI and drug use. He was also aware that Maines’ driver’s license was currently under suspension. While speaking with Maines about injuries, specifically to his left shoulder, Cowan detected a strong odor of marijuana coming from the vehicle. He observed that Maines had glossy, blood-shot eyes and that his pupils were extremely dilated, a common side effect of marijuana use. Cowan asked Maines if he had consumed any drugs and he admitted to having recently smoked marijuana. The officers notified County Control that another ambulance unit would be needed for Maines. When Cowan attempted to remove Maines’ seatbelt, he located one marijuana grinder in plain view on the driver’s side floor. It was seized and later it was discovered to contain a small amount of marijuana. Maines told officers that he was willing to cooperate and continually commented that he “didn’t want to get in trouble,” which was why he fled. He said he was willing to submit to a legal blood draw, and it was conducted on-scene in the presence of Neeper. With both men in custody of emergency services, Neeper related that he saw a clear, plastic container on the rear seat in plain vehicle. A subsequent search of the vehicle allegedly turned up one green bong containing burnt residue, which was seized from the center console, along with two cellular devices and a GPS unit. Both men were flown to the UPMC Altoona Hospital and officers requested a Pennsylvania State Police Accident Reconstructionist and a forensics unit to respond to the scene. Upon completion of the on-scene forensics and reconstruction, Cowan and Neeper transported seized evidence to the police station. It was discovered the clear box contained a small amount of marijuana; a clear bubble glass pipe, which is commonly used for methamphetamine consumption; one blue glass pipe, which is commonly used for marijuana consumption; small baggies; and a digital scale. On May 10, Cowan spoke with Maines’ passenger and he agreed to an interview. He said he was aware Maines had smoked marijuana prior to picking him up because he could smell it inside his vehicle and he knew Maines also had marijuana, pipes and a bong. He said when Maines saw officers, he became “paranoid” because he was on probation and had bail set in previous cases. He said when officers did the U-turn, Maines accelerated, which he told him not to do. He went on to say that when Maines took the turn onto Good Street at 40 miles per hour, it almost caused him to crash the vehicle. He said he told Maines not to act “suspicious,” but Maines continued to drive aggressively and he suspected their vehicle had “gotten air” when they passed officers on Mapes Avenue at approximately 60 miles per hour. At one point, the passenger said he wanted out and Maines pulled over. However, he re-entered the vehicle and Maines told him he was going to “run” because he had his mind set on it. He said he didn’t want to, but Maines refused to listen to him. The passenger said just before they crashed, he looked to the speedometer and it read approximately 115 miles per hour. On May 18, Cowan received a laboratory report, which showed that Maines was under the influence of various controlled substances, including amphetamine, methamphetamine, Hydrocodone and THC. On May 23, Cowan interviewed Maines about the pursuit and subsequent crash. He said the reason he fled was because he had a suspended driver’s license, was under the influence and he was in possession of drugs and paraphernalia. Maines allegedly admitted that he’d taken Hydrocodone the previous night and had consumed marijuana and methamphetamine inside the vehicle about 10 minutes before he operated it. He also admitted that all of the drugs and paraphernalia, which officers had seized, belonged to him. Cowan asked Maines how fast he was driving at the time of the crash, and he indicated approximately 100 miles per hour. Maines was then asked about his passenger’s condition to which he said he would likely have scars, due to several lacerations, on his facial area and right arm for the rest of his life.